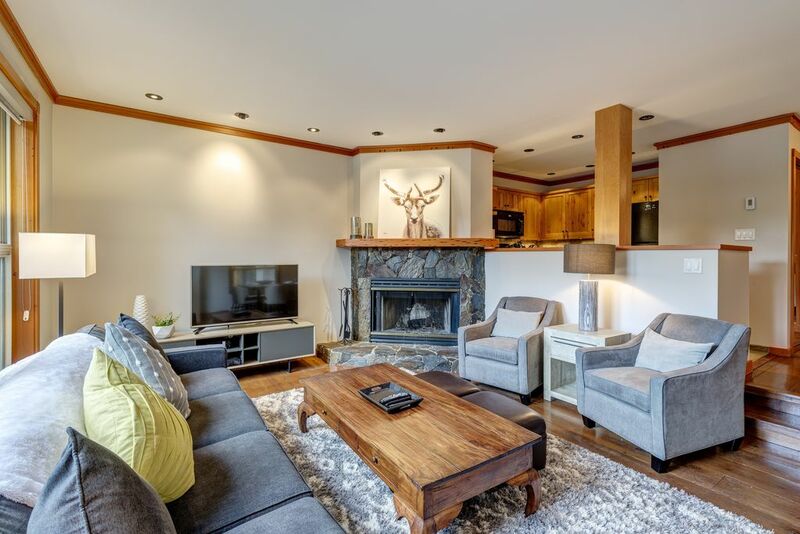 Welcome to our new 2 bedroom, 2 bathroom townhouse situated among the trees in the Blackcomb Benchlands area. Close to the Upper Village and the slopes of Blackcomb Mountain where you can ski-in from the Lower Cruiser Blue Run. Lost Lake Park and the Valley Trail are just steps away, as is Chateau Whistler Golf Club making this a perfect sun or snow retreat. The spacious unit offers a master bedroom with king size bed, flat screen TV, and en-suite bathroom with heated floors and steam shower. The second bedroom has a queen-twin bunk bed and a flat screen TV. The townhome is fully equipped with high ceilings, wood burning fireplace and private balcony. Enjoy the comforts of your own home at Whistler Snowgoose such as free premium cable TV (including NETFLIX) and wi-fi, well stocked kitchen and laundry facilities. Secured underground parking is provided where your automobile will sit and stay as there is a free bus shuttle that stops a few steps from the front door of the townhome every 10-30 minutes year round. It will get you to all the ski lifts or anywhere in town where you can enjoy shopping, restaurants, concerts, kids playground, ice skating and other activities. Smoking is absolutely not allowed. No pets. NO PARTY GOERS. Up to 5 persons total. Adult renter must be at least 25 years old. We are born and bred British Columbians and have lived in Vancouver most of our lives. We currently live in Vancouver where we raise our 5 and 2.5 year old children. My husband has been snowboarding since the very early days of the sport, and I am a novice snowboarder but love the outdoors. We have been travelling up to Whistler for the past 20+ years, and love it more and more each time we visit. We look forward to raising our children here, and when we can't, let us open our doors to you! We have travelled extensively throughout our own province and to many destinations around the world. We have dreamed of owning recreation property outside the city, and we knew Whistler was the place. With its world renowned skiing and snowboarding in the winter, and the golfing, biking, and swimming in the summer, it's the perfect four season place to get away for our family, and know that you, too, will enjoy the activities and attractions. The first moment we saw this townhouse, we knew it was the perfect place for our family. It is warm and inviting and with the wood trim and fireplace, it had that ski-resort feel, but at the same time, the high ceilings and open concept makes it very spacious and comfortable. It's just the right combination of details that we were looking for. Located in the Benchlands of Blackcomb Mountain in the Upper Whistler Village, the townhouse is just a 10-15 minute walk or a 2-5 minute complimentary bus service to the Blackcomb or Whistler Village lifts. The bus runs frequently throughout the year and picks up just outside the door. The location is near the Fairmont and Four Seasons hotels, across the street from the Valley Trail and sandwiched between the Chateau Whistler Golf Course, Lost Lake, and all the bike, hike, snowshoe and ski trails of Blackcomb Mountain. In the winter you can ski-in right to the door! Perfect for all ages and all seasons. This property is far enough from the village that you can unwind from the city, but still close enough to be just minutes from all that Whistler offers. Peek-a-boo view of Chateau Whistler Golf Course. Ski-in to the Snowgoose complex on the Blackcomb Mountain "Lower Cruiser" blue run. 3 portable air conditioners are set up in the summer months; one in the dining/living area and one each on the bedrooms. Also includes radiant floor heating in the kitchen and bathrooms. 1 complimentary fire log provided during winter season. Comfortably seats 6 or more people. Drip coffee make as well as a top-of-the-line Nespresso maker. Complimentary coffee (some Nespresso and ground coffee), tea, sugar, salt and pepper, spices, olive oil and balsamic vinegar. Saran wrap, aluminum foil and parchment paper also provided. Service setting for 6 and all kitchen supplies provided. Infant/toddler feeding booster chair available upon request. 3 TVs; one in the living room and one in each bedroom. Premium cable channels, including NETFLIX. A variety of games for adults and children. A few games and puzzles for children. A gas BBQ available year-round and patio furniture available in the spring and summer. Only a few minutes on the free shuttle bus to Blackcomb Mtn accessed right outside the unit, and ski-in directly back to the unit weather permitting. We had a great stay at this place. The townhome was comfortable, clean, fully stocked and in a very convenient location close to the trails and all other amenities. Vivian was so gracious and checked in to make sure we were well taken care of. We are definitely going to stay here again. Thank you ! Great location! Perfect for skiiers and those just looking to enjoy the village. We are happy to hear that you were pleased with the location, close to the mountains and village! Hope to see you back again soon. Our family of 4 just returned from a week of skiing at Whistler and enjoyed staying in this great condo. The condo was nicely decorated and furnished with everything we needed. We all enjoyed the steam shower and heated floors. Loved the bunk beds in the second bedroom, so the kids each had their own space. The bus pickup is just steps away from the door and we skied back to the condo every day. It is close to the main village, but you felt far away from everything. Would recommend this for anyone looking for a great getaway to the beautiful Whistler and Blackcomb mountains. We are so happy to hear that you and your family enjoyed our home, and all that it had to offer. We hope you can come back again soon! We very much enjoyed our stay at the snowgoose condo. It was very clean and comfortable for our family of four. We appreciated the heated floors and open layout of the condo. The kitchen had everything we needed and the nespresso machine was a very nice treat. The steam shower was amazing and perfect after a day of skiing. Our boys appreciated the games and puzzles in the condo and loved the comfy bunk bed. Vivian was very responsive to my questions. We would definitely rent this condo in the future. We are so happy to hear you enjoyed your time with us! Also nice to hear you enjoyed the games and puzzles - we have not had any feedback on this so nice to hear they are being used. Our family loves games and puzzles so we want to make sure they are well stocked - a chess and checkers board is going up next week so hopefully you’ll come back and get a chance to play...and also enjoy a little skiing too ;). It was very clean and had everything that we needed. Quietly situated. Perfect for us. We loved staying here! The condo is beautiful, clean and comfortable with thoughtful details like Nespresso machine for lattes in the mornings, heated floors, and great toiletries. The free shuttle to the lifts stops directly in front of the condo. Complex was quiet, well maintained and overall we recommend staying here! We are pleased to hear that you enjoyed our home and it’s location. Also happy to hear that you enjoyed the espresso machine, and agreed, such a pleasant way to start the day! We hope to see you all back again.